Americans of the 1920s seemed so preoccupied with enjoying the present that celebrating the past was destined to take a back seat. That decade is best remembered for inventive and oftentimes silly fads that drew life from the nation's new prosperity and the relaxing of Victorian morality. Even so, there were those who still recognized the nation's heritage. Important anniversaries were not forgotten. 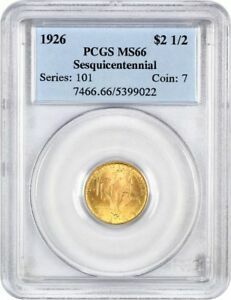 Among the ways in which Americans of the Roaring ‘20s marked these occasions was through the issuance of commemorative coins. These recognized statehood centennials, the Monroe Doctrine, the arrival of the Pilgrims and various other highlights of U. S. history. Perhaps the most significant celebrations, however, centered around the sesquicentennial or one hundred-fiftieth anniversary of the War of Independence. 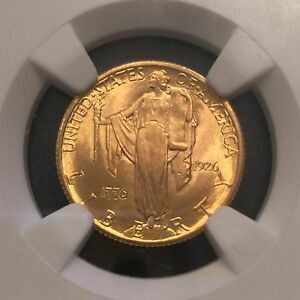 Two coins were issued recalling important battles, but the most important event of all was the signing of America's Declaration of Independence, dated July 4, 1776. This momentous occasion was remembered through the minting of commemorative silver half dollars and gold quarter eagles bearing the dual dates 1776 and 1926. 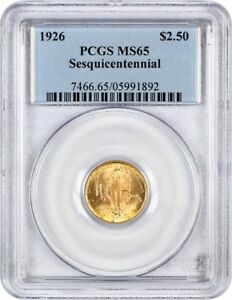 Both coins were authorized by legislation that passed on March 3, 1925. This bill also created the National Sesquicentennial Commission to oversee celebrations planned for the anniversary year of 1926. The centerpiece of these events was a Sesquicentennial Exposition in Philadelphia, birthplace of the American Republic. Wear first appears on the hands adjacent to the escutcheon and on the wreath's bow knot. It was hoped that profits from the commemorative coins would offset the cost of this fair, and great prospects were held for their sale. 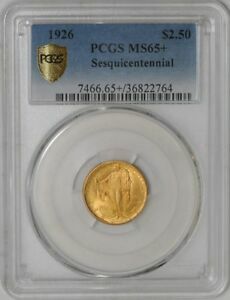 Once again forgetting the sad history of commemorative coin programs, with their high percentage of unsold coins, Congress authorized the minting of up to one million half dollars and 200,000 quarter eagles for the sesquicentennial. 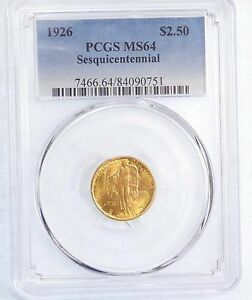 The Commission also sought the coining of an unprecedented $1.50 gold coin as part of its ambitious scheme to offer a series of coins depicting important events from the nation's first 150 years. To these would be added a commemorative one dollar note. Not keen on commemoratives of any kind, Treasury Secretary Andrew Mellon disapproved all but the half dollar and quarter eagle, the only coins to survive in the final draft of the bill. As Chief Engraver George T. Morgan had recently passed away, the Mint assigned to his successor, John Ray Sinnock, the task of designing the two coins and preparing models for them. The Sesquicentennial Commission was not enthusiastic about Sinnock's concept for the half dollar. It engaged outside artist John Frederick Lewis to create something better, leaving for Sinnock only the preparation of final models. The Chief Engraver scored with his sketches for the quarter eagle, however, and there was then just the Commission of Fine Arts to overcome. Its sculptor member, Lorado Taft, must have found them acceptable, as the Commission gave its approval on March 25, 1926. This included, however, suggestions that some of the lettering be rearranged and that the sun and its rays be omitted from the reverse. Sadly, as it would turn out, this second suggestion was not followed. Sinnock's design for the quarter eagle features a full figure of Liberty standing upon a partial globe. 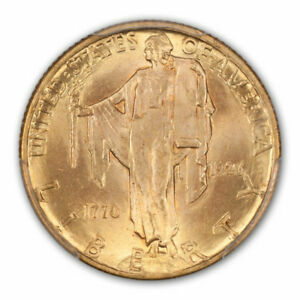 She is dressed in a long, flowing gown and wears a folded cap, somewhat reminiscent of our early coinage. 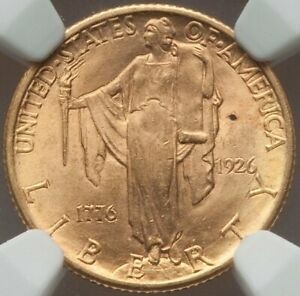 In keeping with the style of the 1920s, she is slimmer and more flat chested than the classical maidens and matrons depicted on older U. S. coins. She faces the viewer's left, to where her right arm is outstretched, clutching the torch of freedom. In her left hand she holds a long scroll which is supposed to represent the Declaration of Independence, although its proportions are entirely incorrect with respect to the actual document. The legends UNITED STATES OF AMERICA and LIBERTY are arranged in arcs around the periphery. 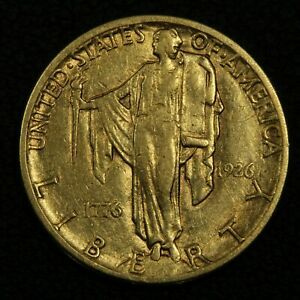 The dates 1776 and 1926 appear to the left and right of her figure, respectively. On its reverse, this issue displays a frontal elevation of the Pennsylvania State House, better known by its later name of Independence Hall (the bell once contained within is the famous Liberty Bell, now exhibited separately on Independence Mall within a glass enclosure). Above Independence Hall, divided by the belfry, is the motto IN GOD WE TRUST. Our national motto E PLURIBUS UNUM appears below. Arranged around the periphery are the inscriptions SESQUICENTENNIAL OF AMERICAN INDEPENDENCE and 2 1/2 DOLLARS. Sinnock's initials JRS are found above one wing of the hall at right. The rays of the sun may be seen on only a few specimens, emanating from a point behind the hall. This feature is extremely shallow, even on the original models, and it seldom shows distinctly. The Sesquicentennial Exposition was held in Philadelphia from June 1 to November 30, 1926, and it featured major exhibits in the arts, sciences and industries. A few of these, however, were not finished in time for opening day and for some weeks afterward. The exposition was not publicized nationally and received little support from the United States government. Its success depended entirely on the willingness of visitors to spend money at the various concessions, since the fair was funded almost entirely through commercial ventures and bonds. Opening Day, June 1, was rainy and miserable, and it proved a bad omen for the exposition. The excitement generated by that city's Centennial fair fifty years earlier was lacking. 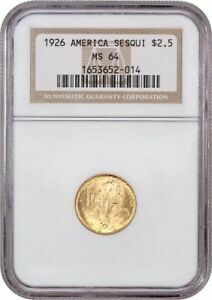 Although nearly six million people attended the 1926 event, few opted to buy commemorative half dollars at $1 apiece or quarter eagles at $4 per coin. 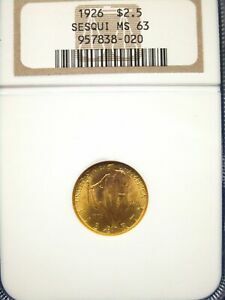 In May and June of 1926, the Philadelphia Mint had optimistically coined the full authorization of 1,000,000 halves and 200,000 quarter eagles, yet only 140,592 and 45,793 were sold, respectively. 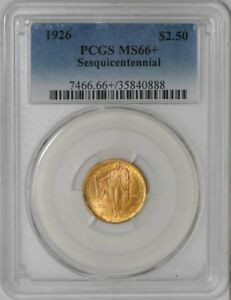 The remaining balance, including assay pieces totaling 528 for the half dollar and 226 for the quarter eagle, were returned to the mint at the close of the exposition and were subsequently melted. Both coins were modeled in extremely shallow relief, and many design elements are difficult to discern. On the quarter eagle, the sun's rays are invisible on some coins and have been described as looking like a fingerprint when they do show. Despite these deficiencies, both issues are attractive when well preserved. Unfortunately, such coins form a minority of the survivors. 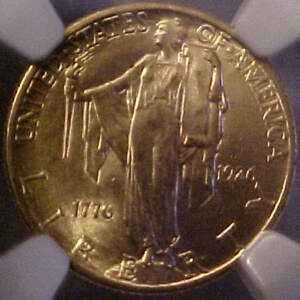 The quarter eagle is frequently found with signs of careless handling suffered both inside and outside the mint. 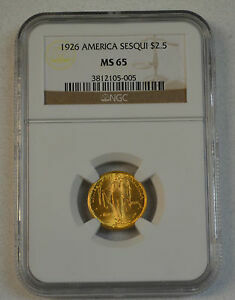 As many were purchased by non-numismatists, they were subject to poor storage, as well. 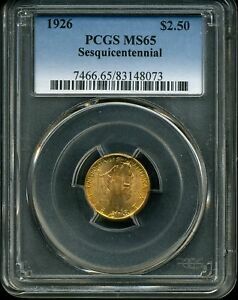 Commonly seen are coins with numerous small contact marks; these will grade anywhere from AU-55 through MS-63. Examples grading higher are scarce, with gems that grade MS-65 being particularly elusive. Luster on these coins ranges from a subdued frostiness to a much more brilliant frost. Wear first appears on the obverse at the bottom of the scroll; on the reverse, check the clock tower just above the roof line. 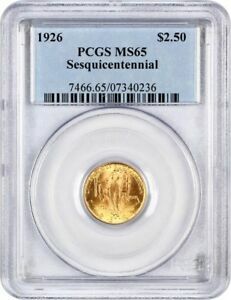 A couple of matte proofs are known of the quarter eagle. These have a dull finish but much sharper details, although some design elements are still lacking due to the poor modeling of this issue. Separate obverse and reverse die trials in copper and brass also exist. These are as sharp as the proofs. The quarter eagle was distributed without holders at the Exposition, but additional coins were marketed through the Franklin Trust Company of Philadelphia in small envelopes bearing its name and address in blue ink. Also found are Christmas card holders imprinted with the Liberty Bell and the anniversary dates; these were issued by the Bethlehem National Bank of Bethlehem, Pennsylvania. At least two issues of counterfeits have been made of the quarter eagle; authentication is recommended for any coin of this type.